Instead of executing your app directly, create a run.bat or run.cmd file which will help you to configure your application command line parameter if any or if you have multiple executables in the zip file. For this post I am creating a simple console application, which prints date and time to the console and you will be able to see it in the WebJobs console. Next publish the app using publish command. Next you need to create the run.bat file, you need to make sure it is correctly encoded as a UTF-8 file without BOM (by order marks). Otherwise it may not work properly. Here is my code in the run.bat file - dotnet DemoWebJob.dll. Once it is created, compress the zip file and upload it to the azure portal web jobs area. For the demo post I am using Manual mode. Here is the list of Web Jobs. 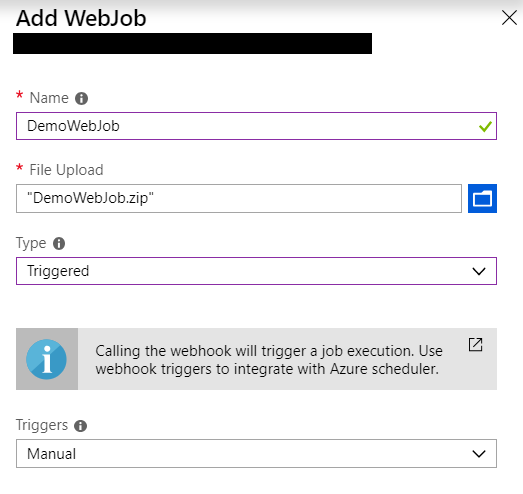 Next you can click on the Run button to execute the Azure WebJob. Once it is running, you can click on the Logs button to view the details of the selected web job, it will display something like this. In this post you learned about deploying a .NET Core console application to Azure app service as WebJob. In the next post you will learn about deploying Web Jobs from Azure DevOps.